Despite what some literature snobs would have you believe, a book and its film version go hand in hand. The movie allows you to see the characters and events that you have become familiar with, and if the screenplay was written by the author, then the events of the film might be considered part of the books canon. When experienced together, the viewer receives a fuller picture. If you love books and movies, why not start a Book and Movie club? It's similar to a book club but with one major difference – participants read the book and then study the film version. You can, of course, make up your own rules, but this is a basic template for getting started. First, gather together a group of interested people (most important!) Next, agree on a regular meeting date. Remember that you need to allow time for everyone to finish the book – once a month is the standard. 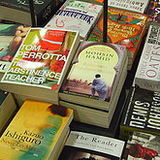 Everyone in the group should get a chance to choose a book, and the person who chose the book is usually the one to host the group for a discussion. Your discussion can be as informal or as academic as you wish. You might like to pose some questions to get the discussion started – Reading Group Guide and The Book Haven have a good selection. Once you've finished discussing the book, you can then watch the movie. This may be done on the same night or you might organise a further date – for example, book club meets on the first Monday of the month and film club meets on the following weekend. Leave yourself enough time to discuss the movie afterwards. Here's a basic guide on discussing the differences between the movie and the film. When choosing books, allow for reading time – something by Tolstoy probably isn't appropriate. Some good examples include The Time Travellers Wife by Audrey Niffenegger, Rita Hayworth and the Shawshank Redemption by Stephen King or any of the Harry Potter books by JK Rowling.